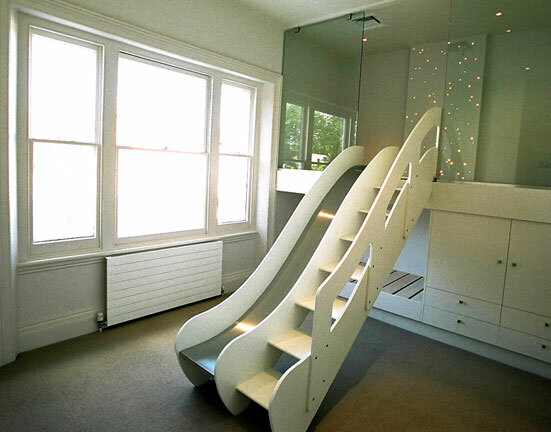 All the bespoke furniture in the childrens bedroom was made from spray-lacquered MDF. We mounted a winch into the ceiling so that the slide could be hoisted up at night to make it inaccessible to the children. We installed fibre optic lights above the bed and in the panel on the play platform. In the master bedroom, we made two freestanding wardrobe units, the bed, and bedside tables and drawers, all from spray-lacquered MDF. The kitchen consisted of a main island unit with twin hobs on a glass worktop, with a cooker hood above. We built a Wenge wood bench, which wrapped around one end, and added a stainless steel table at the other end. The wall units and base units were spray-lacquered and finished with bespoke stainless steel handles. This walk-in wardrobe was made from American Walnut. The conservatory/roof terrace was built using a steel frame structure, and featured a warm decked flat roof with glass walkway and roof lights. This was clad with stainless steel, and the bespoke spiral staircase and roof terrace floor were made with pre-cast concrete.